Mandate says that the sale of the debt of the landmark store should prioritise jobs. 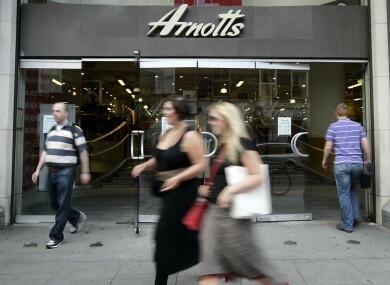 THE UNION REPRESENTING some of the workers at Dublin’s landmark Arnotts store says that it is concerned about the future of 1,200 jobs at the store and another Dublin store, Boyers. Mandate says that it has worries about the sale of the debt of the company, which has been held by IBRC and Ulster Bank since 2010. It has been rumoured that Ulster Bank will make a decision on the sale of its share of the debt this week and that a number of restructuring firms have expressed an interest. Mandate General Secretary John Douglas says that any sale of the debt should prioritise jobs. Arnotts and Boyers workers have gone through a very painful and difficult five years. Nonetheless, they have worked with the current management to turn Arnotts and Boyers around in a very difficult retail environment, once again making Arnotts a unique and successful Irish retail brand. Email “Union expresses fears for Arnotts and Boyers jobs”. Feedback on “Union expresses fears for Arnotts and Boyers jobs”.